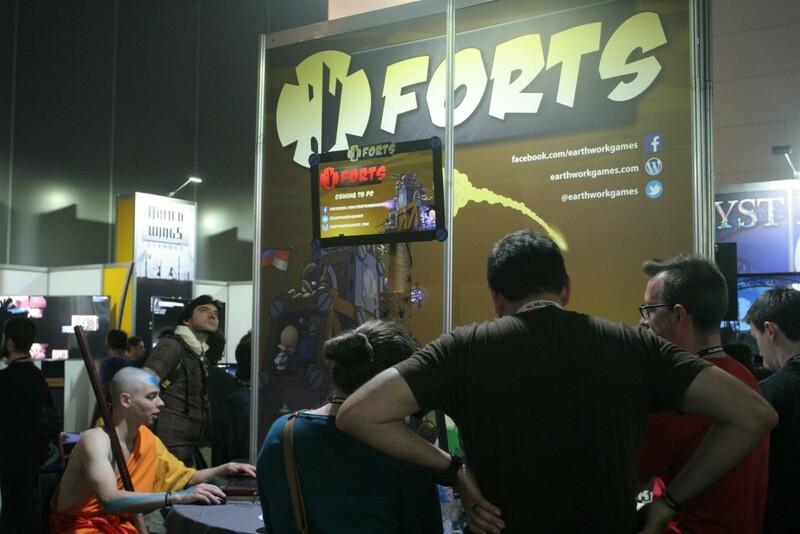 I met the guys from D1DLC at AVCon and they were well into Forts. They gave me a short interview for their podcast, which you can see below. The beta key competition on Facebook mentioned in the video is still running if you’d like to enter. 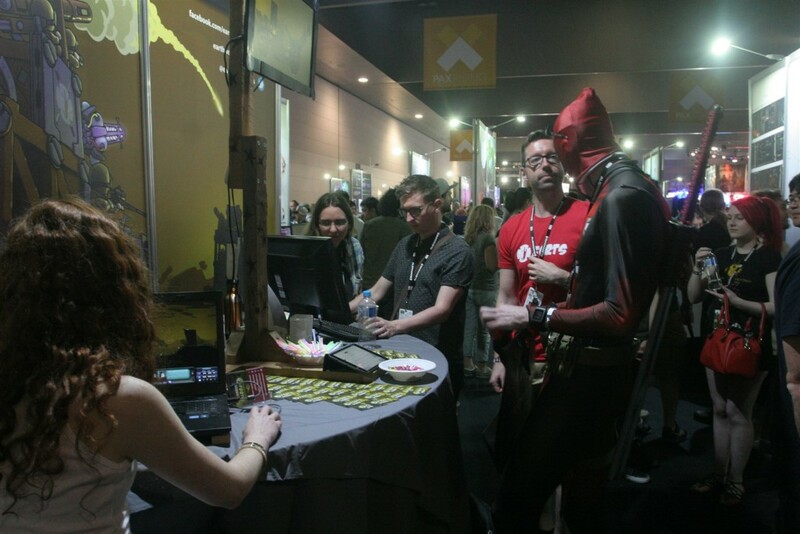 It’s been two weeks since PAX Aus ended. We’ve taken stock of what happened and what we accomplished. 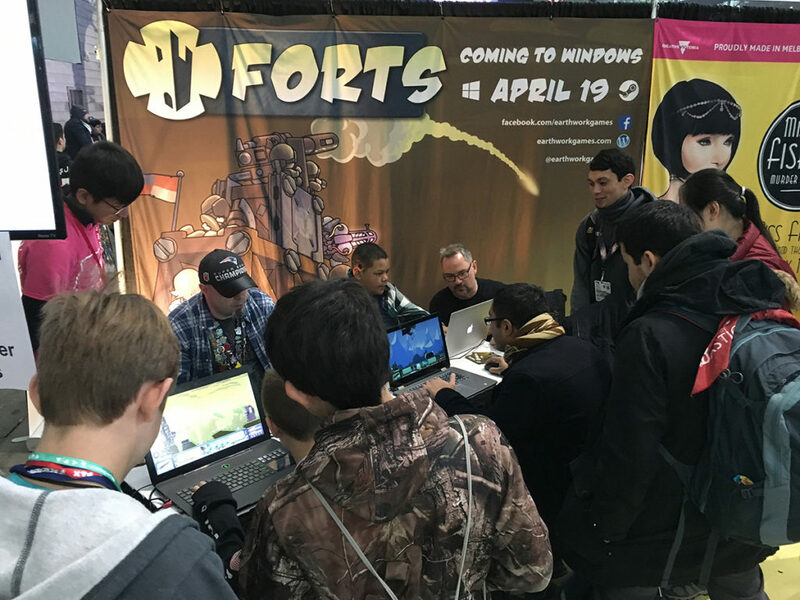 While it was not the first time we had publicly shown off Forts (that honour goes to our local GameOn exhibition), it was certainly the biggest yet. There were a lot more people coming past and press booking interviews. With the exhibitors fee, flights, accommodation, and a fair bit of preparation needed, the stakes were pretty high. Would people ‘get’ the game? Was it stable enough? Were people able to learn the controls? Do we have a chance of getting some good press? Let’s find out, dear reader. We managed to get all of our equipment to Melbourne without damage and did most of our set up on the Wednesday, giving us time to troubleshoot anything before the expo started on Friday. We only had two playable terminals and one small TV to loop the teaser trailer plus another video that Nick had made to show the features of the game. I had built a mini ‘fort’ to hold our monitor. The idea was to get it above the crowd so people could see it from a distance. I even drilled bullet holes and stenciled burn marks radiating out from them. We had 1000 Forts contact cards and some candy for people to take. Thursday was spent tracking around Melbourne getting a few missing items such as a suitable ethernet cable for multiplayer games, head phones, gaffer tape, an adapter, screen wipes, insoles (a great feet-saving idea), and Strepsils (thanks for the tip Kamina!). 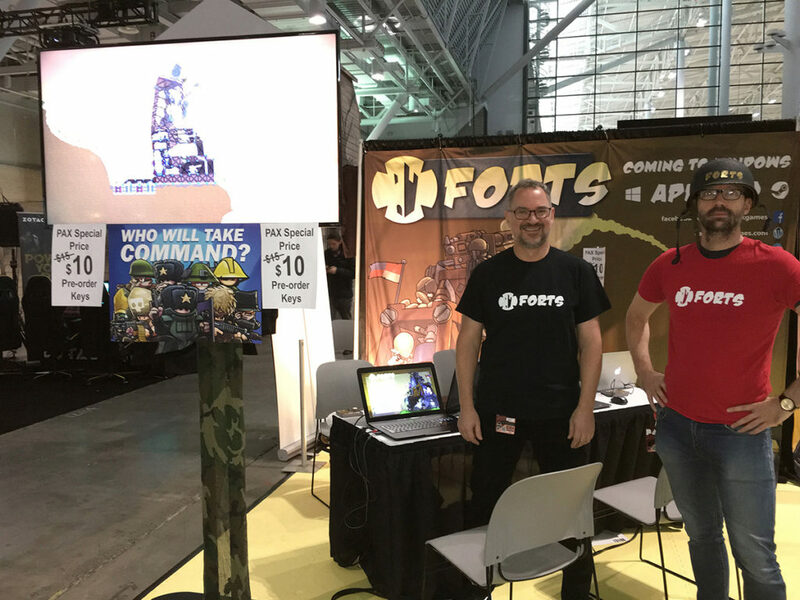 We even had matching Forts t-shirts and the sign that Nick designed looked brilliant. 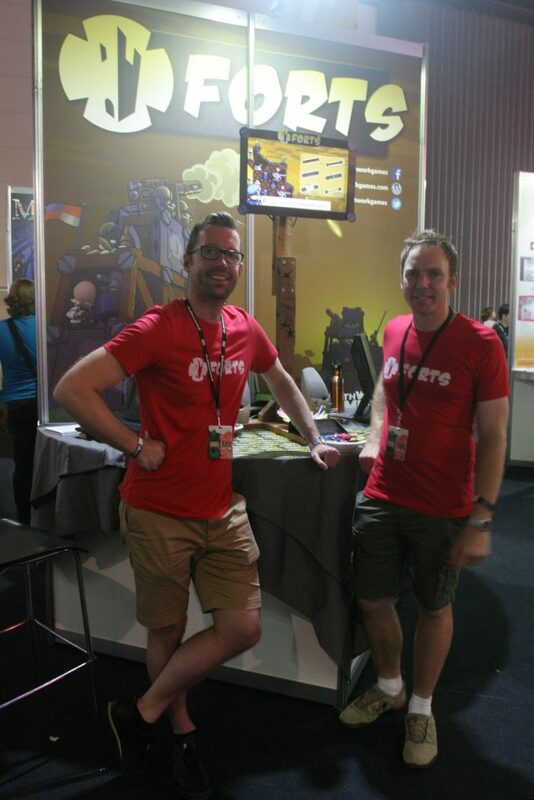 Artist Nick Smith and coder Tim Auld with the Forts stand at PAX Aus 2015. The press were there an hour earlier than the general public were let in on Friday. 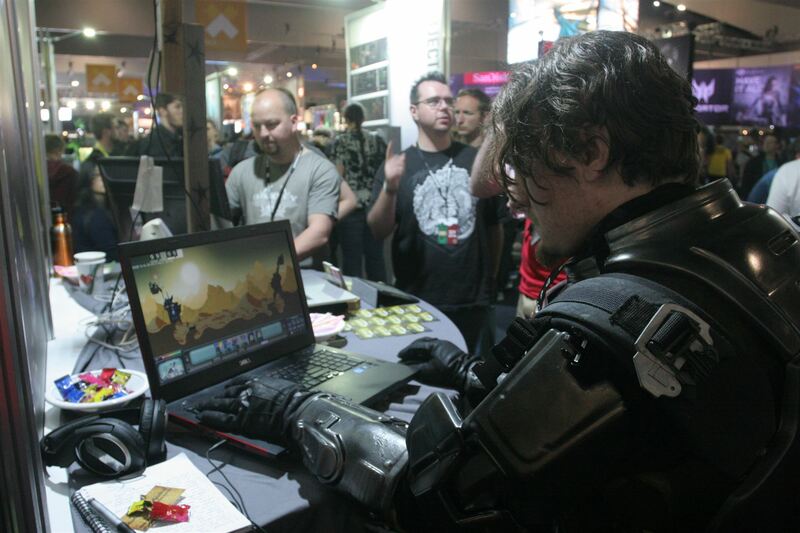 We managed to get ready to show the game in time, but it was not a mad rush to begin with. At about 9am the crowds started trickling through and Forts started to get some attention. The punters were getting into it, it was great! 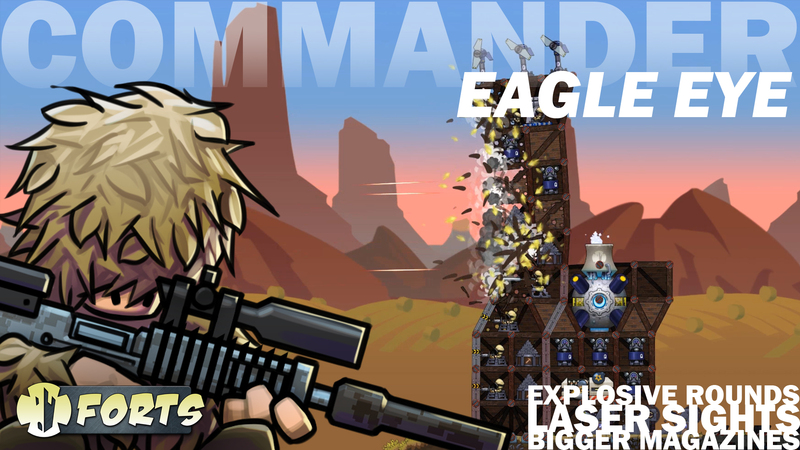 We had planned to run a ‘tallest fort’ competition on a special mini-game map, but too much fun was being had blowing stuff up so we dropped the idea. Many were signing up to our mailing list anyway. 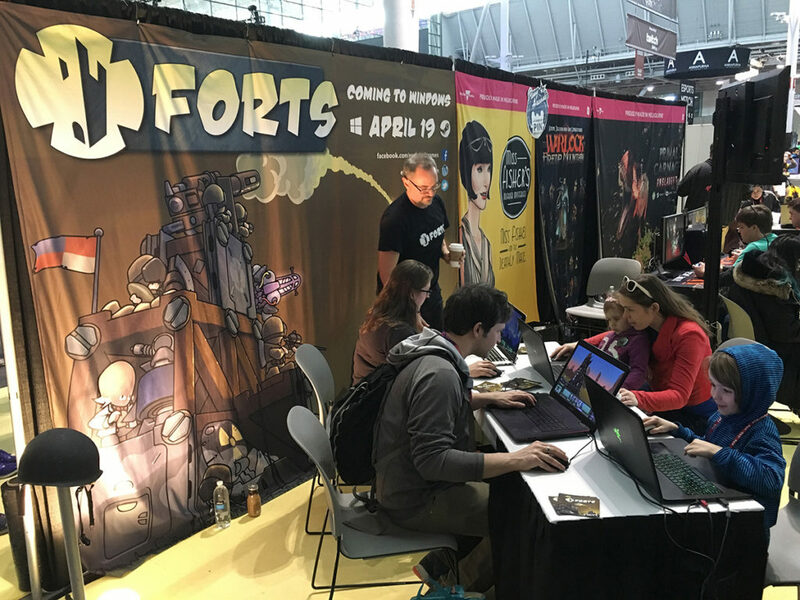 On the first day I counted six people who came up and said that Forts reminds them of a pencil and paper ‘game’ they used to play when they were young. One dad even said he still plays it with his son. The way it goes is each player draws up a fort on each side of the paper, puts in little weapon emplacements, and then takes it in turns to draw dashed lines, showing where the projectiles were being fired. Yes, it relies heavily on imagination. It’s so unfortunate that none of the original battles I drew from my childhood have survived. I was happy to see the game evoking nostalgia in so many. Monks are one of our target demographics. Quickly it was discovered that the game as presented was too hard for new players, so I made a few changes at the end of the day to improve the situation. The swarming missiles’ incendiary capability was disabled. The fire was made to spread at half the rate and do half the damage. The repair area radius was doubled. Some of the AI’s forts were crippled a little bit too, as they would just pepper the new player, making it difficult to coach. 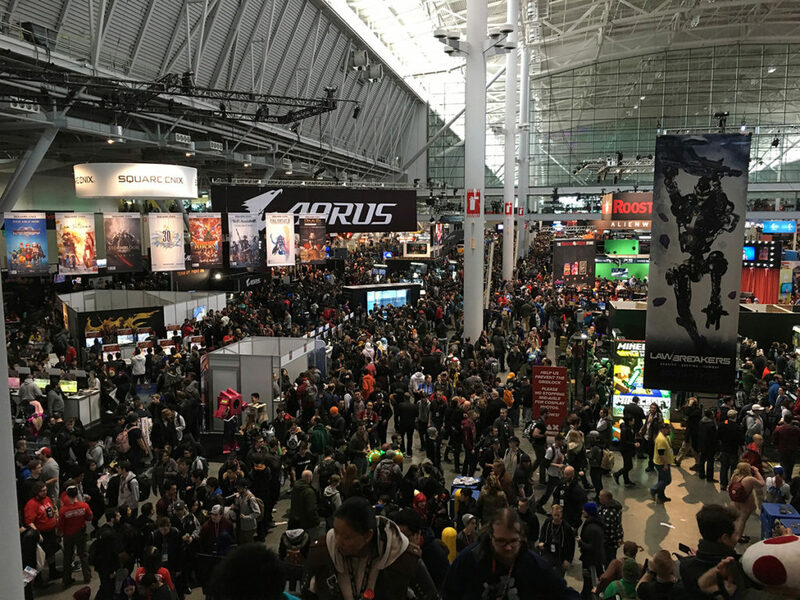 In spite of the learning curve, the PAX goers were excited about the game and many wanted to know when it was coming out. We ended up giving away about 750 of our cards. During a lull I suggested to Nick we have a multiplayer battle against each other to show how the game plays out at high skill levels. Soon there was a gathering around us watching the game. It was a fun match and two of the spectators wanted to play each other afterwards, even though they hadn’t played it before. 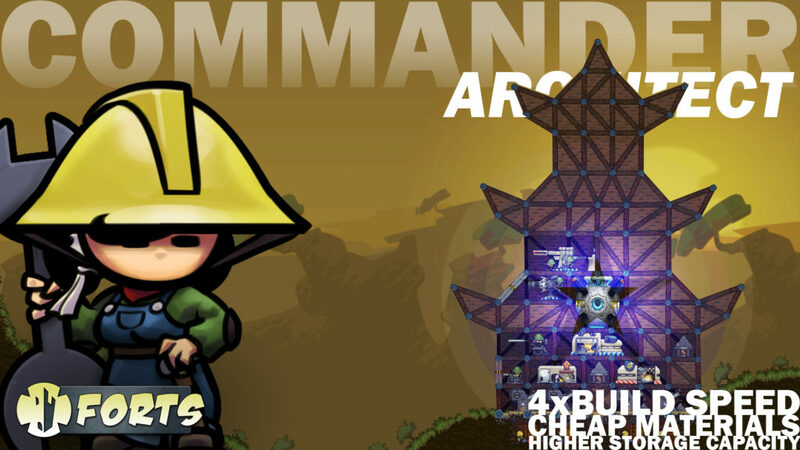 Nick and I coached our respective fort commanders; it was very tense! Nick’s player was victorious with a tried and true laser attack, our fort having insufficient armor to take the blow. We would have loved to see more of these head-to-head games, but one or both terminals were almost always in use, making it difficult for friends to claim them both at the same time. Deadpool is one of the biggest (and tallest) Forts fans. Saturday was supposed to be the biggest day. It probably was a bit more busy but it was hard to notice. You have to remember to eat and drink. The insoles and Strepsils were serving us well as being on your feet talking all day takes its toll. We were having a steady stream of media come and ask us about the game with varying degrees of preparedness. It was always fun, as they asked some of the best questions. It’s been thrilling to see us top a few ‘best indie game at show’ lists. Crippling the AI fort by taking out their big weapon proved to be counter productive. It meant the player could be coached without the threat of being wiped out instantly, but when left alone the player would just continue indefinitely, preventing others from trying. I had to reintroduce the cannon to one of the maps to give the battle a timely end. 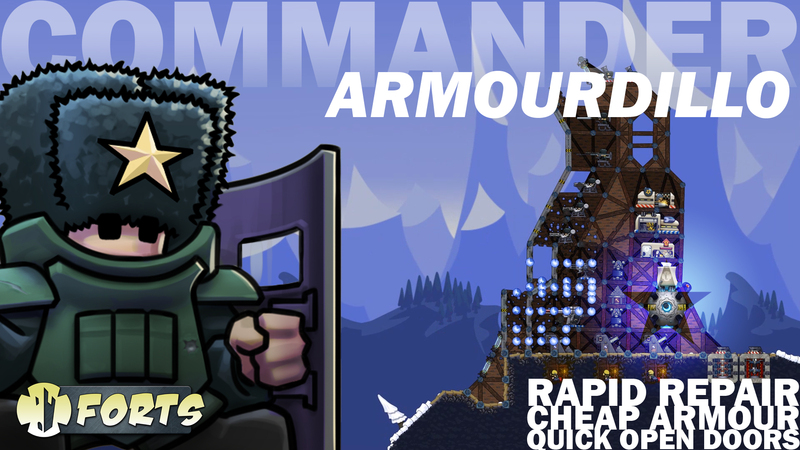 Gauntlets are not recommended when playing Forts. By Sunday we had our pitch and coaching routines down pat. People seemed to learn it faster and have more fun. The AI was still making it difficult. More effort will have to go into making a good show map and configure the AI to give players a chance to learn without leaving it open ended. We were enjoying ourselves, and some people were coming back two or three times. A few were turning up saying a friend had recommended they check out our game. It felt great to hear that. After a hectic weekend I got about half an hour to wander around and play a few of the other indie games in the PAX Rising area. I wish I had more time to do this; it was good to meet other developers and talk about their pride and joy, the issues they were facing, and try some cool games. 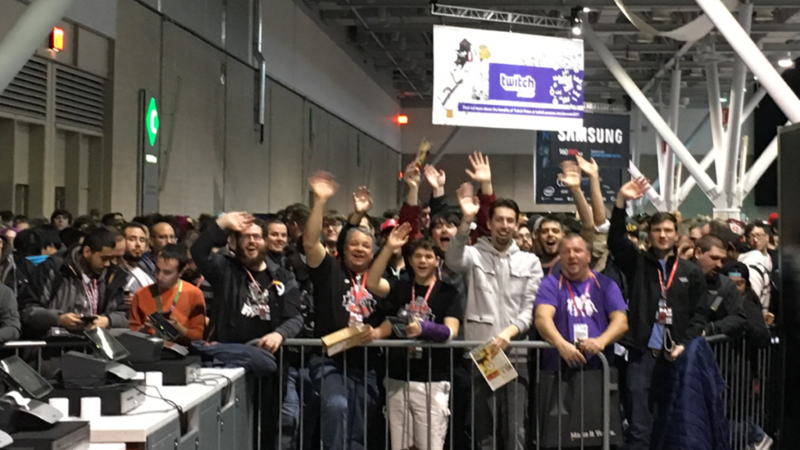 The amount of support (moral and practical) shown between indie devs was wonderful, and I think everyone partly wished the event would never end for this, and other reasons. It’s definitely huge for a developer to have a face-to-face conversation with someone who instantly gets their game and wants to know more about it. Same goes for talking with other devs, and some of the conversations can be extremely useful. We received a few hot tips which may make a big difference. It was such an awesome event. 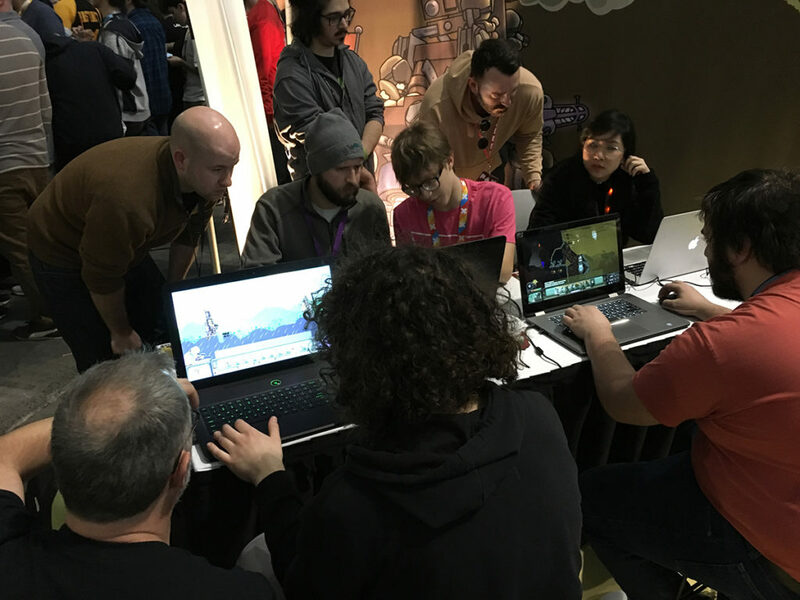 We’re grateful to the organisers, the attendees who gave our game a go, the other devs who gave us support and words of encouragement, and the press who have written, streamed or podcasted about the game. We’re happy that the game was solid and fun for you. Thanks for being patient with the difficulty – we’re working on it. Thanks also to Anna for making us (and Nart) healthy lunches and snacks every day. I hope we see you at the next big show!